if they flower, they will come. I would first like to apologize to the flowers that I could NOT avoid stepping on during this blooming odyssey. I did my best to avoid you, but in some places it was unavoidable. Yes, I’m talking about you, small white groundcover flowers. You blanketed some areas as far as the eye could see and I applaud you for your effulgence and miniature splendor. I tried to tread lightly and stay on free ground, but I know I hurt some of you. I spent the day in the Sonoran desert portion of Joshua Tree National Park, mainly the Pinto Basin area and southwards towards Cottonwood Springs and beyond to the I-10 freeway. That’s were all the excitement was. The upper portions of the park had yet to see much, if any blooms. It was a great day to be in the park. There was only a slight breeze, the sky was clear and temps may have reached 70°. A few puffy, white clouds would have been nice for the skies, but I’ll take a clear blue over an overcast white all day long. 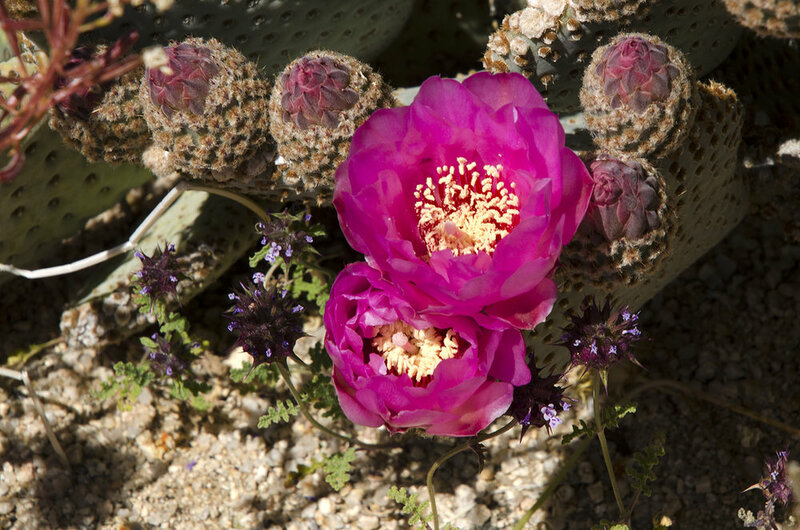 From the Cholla Cactus Garden all the way south along Pinto Basin Road, wildflowers dotted the landscape and the road shoulders. Some hills were ablaze in yellows and orange. The many washes along the route were the true cornucopias of colors - yellow, white, blue and a bit of orange. Porcupine Wash? Smoke Tree Wash? Those were great places to stop and wander. Just pulling over and heading out cross-desert towards the nearby hills in some spots was also amazing. The desert is never flat, and every little wash along the way towards the hills was showing off, big time. I took a LOT of pictures and what follows are some of my favorites from the day. This post may hold the record for having the most images of any of my trip reports, I think it’s around 50. I’m not an expert by any means on wildflowers, so if you see an image without an ID, or an incorrect ID, please comment and let me know. I’ll try to identify as many as I can as time goes by. If you’re reading this close to the original posting date, don’t let time go by too far before you head out to JT to see this super bloom for yourself. And some people say the desert is a barren wasteland (RK). 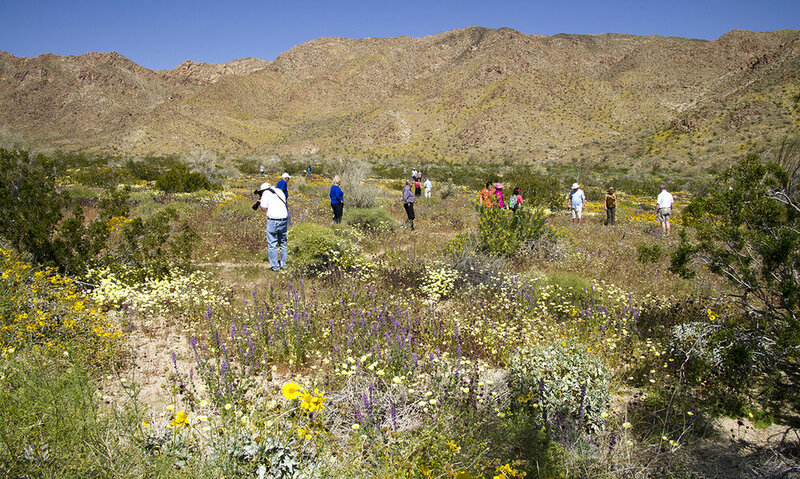 BTW, I found this excellent site on JTNP Wildflowers: click HERE. There were a bunch of these guys along the Bajada Nature Trail. I’m not sure which end is the front. I call them the “Uni-pillar.” However, further research leads me to believe this is actually a White-lined Sphinx Caterpillar, which will turn into a very big moth with a 2”-3” wingspan. Oh, and the orange end is the head, the horn is at the rear. Purple, white and yellow along the Bajada Nature Trail. 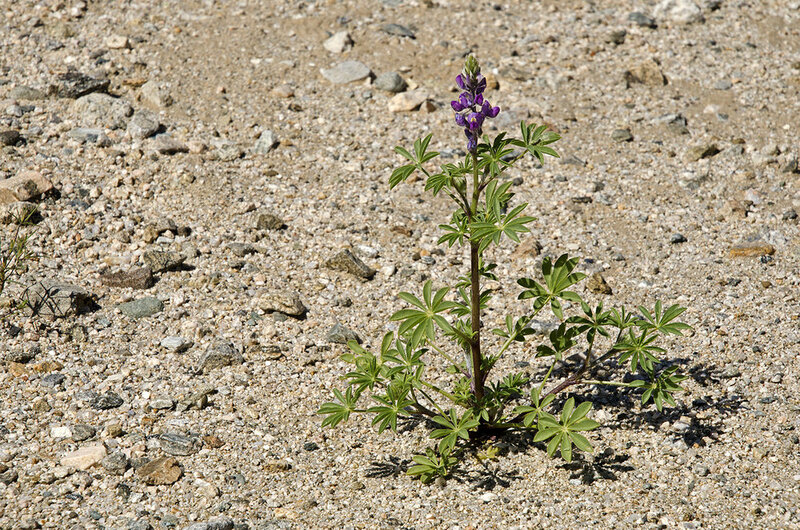 I believe the purple are Arizona Lupine. Here and there, a cactus would have a bloom or two. Almost all that I saw had tons of buds. Come back in about a month for the cactus show. The beavertail cactus on the right was rehearsing. Up in the Pinto Basin area, just heading out from the road towards some hills, amazing places began to appear. 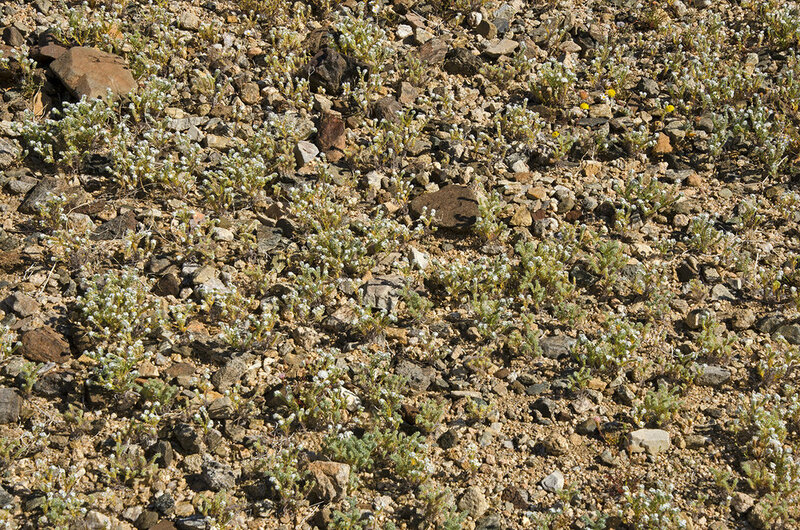 These white ones, Desert Chicory? Ferocactus, meaning "fierce or wild cactus.” They like to act more dangerous than they really are. Approximately one mile away from where I took this picture, there were hundreds of people packed into a relatively small area, enjoying one of the park’s really cool spots. And here was I, atop a small hill with not one soul in sight, enjoying a cool spot seldom visited. Just me and the blooms. Thanks, Mitch! Most of the amazing yellows in this area were made up from these two flowers. The majestic Pinto Mountain serves as a nice backdrop for this shot of one of the many washes that leads down into Pinto Basin. This was one of the most varied and colorful spots I ran across. White, yellow (mojave poppy), purple (purple mat), white. 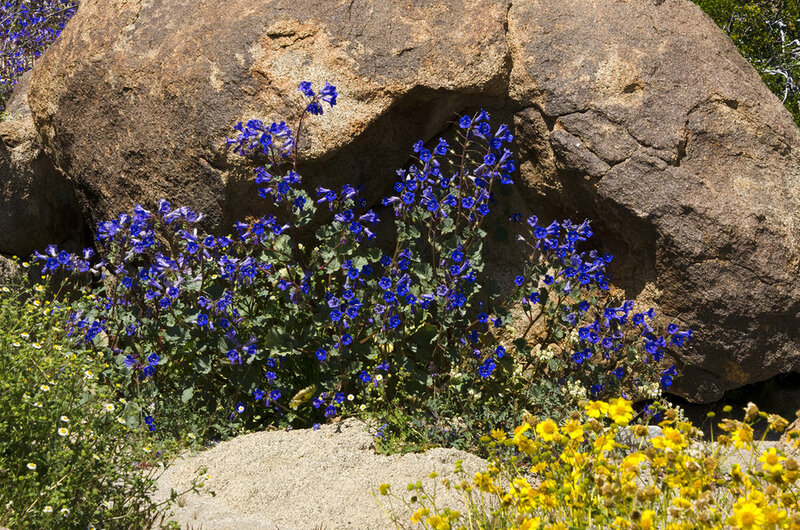 blue (canterbury bells, one of my favorites), purple (desert lupine). It took me longer than I thought it would to finally track down some desert globemallows, perhaps the only orange wildflowers I saw on this trip. I think in a week or two these will be more prevalent. It’s really amazing to drive through a landscape that you’re used to seeing in hues of browns, tans and grays and see patches of vivid colors. Blue is not a color one normally associates with JT, at least I don’t. These blue phacelia/wild heliotrope are a perfect example. There were larges patches of these all over the place. What was really irritating, I’d see something that I needed to take a picture of, and there wouldn’t be a safe spot to stop Tac3 for the next couple of miles. The smoke tree loves the Sonoran desert and requires a lot of water, which is why they love the washes. I don’t remember ever seeing purple mat in the park, but I’m sure I must have at some point. But this year, it was all over the place. This one was another first for me, I believe it is a sand blazing star. If I’m correct, it’s one that provided an important food source for Native Americans in the area, the white seeds of its small fruit were toasted, then ground into a food with a peanut butter-like consistency. If I had been packing a camp chair, this is where I would have spent an hour or so reading. Most of the ocotillo were in bloom. 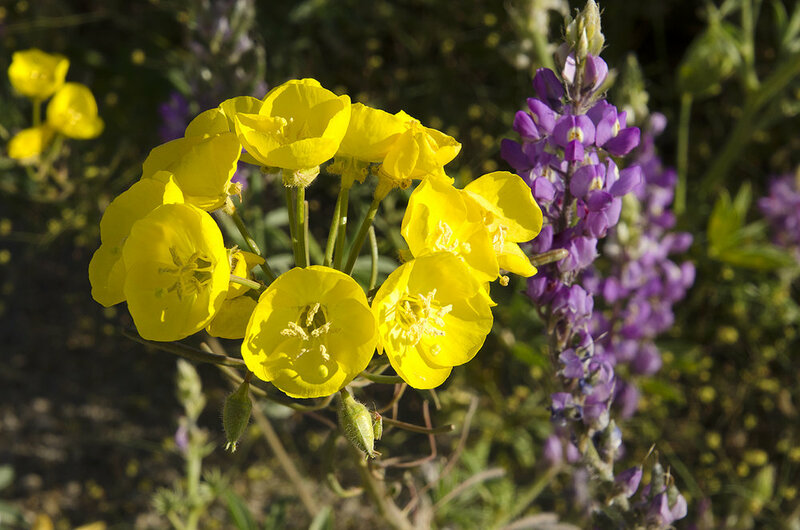 LIke me, these cup-shaped flowers have many alias; Yellow cups, golden suncup, Mojave suncup and desert primrose. 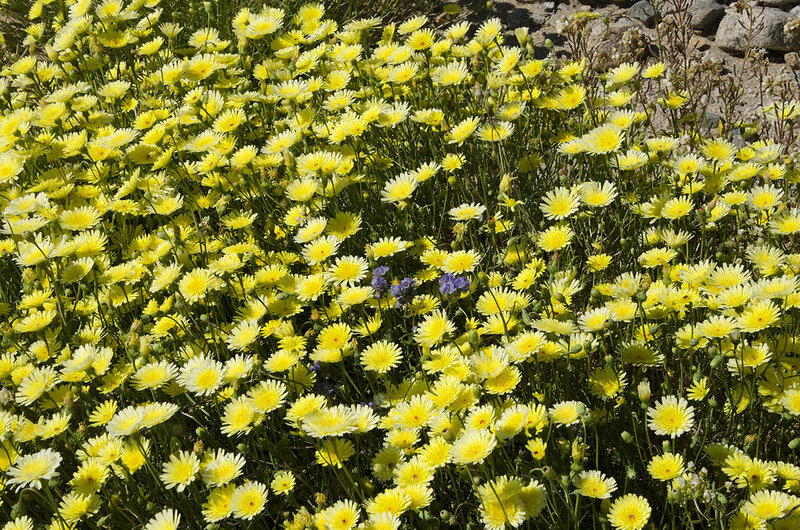 These pretty yellow flowers are known as desert dandelions. They are part of the sunflower family and range in color from yellow to white. I wonder if the name “Golden Bee Mine” might have come from the golden wildflowers on the slopes of the Hexie Mountains. Another nearby mine was called the Yellowjacket, so maybe the name had something to do with bees. And to close out this trip report, here’s an image of something I found near one of the large washes coming down from the hills. Maybe these are “petroflowerglyphs.” The Native American tribes that migrated through this area all had a couple things, at least, in common. They needed reliable water sources and areas to forage for food. Washes coming down from the hills are often great spots to explore for traces they may have left behind. And speaking of traces, please remember to leave no trace while you wander.